This is not just a Thai event ... most other SEA currencies at pushing to multi-year highs also. Big 'ouch' for my battered GBP at the moment; 42baht to the pound anyone? Gone are the days of 95baht. Where is it heading? Any good news on the horizon for us? Last edited by steve w; 20th April 2013 at 04:51. So apart from the Mayans, extinction of dinosaurs, exchange rate and the beaches... what's the appeal of the Yucatan? Last edited by Waharoa; 20th April 2013 at 04:51. Sadly, I dont think so .... Asian growth set to outstrip Eurozone/US for the next 2/3 years at least, so USD/THB back to 25 and GBP/THB to 35 which is the levels they were before the Tom Yum crisis. Shocked to see Baht against MYR, we used to have advantage many years ago, but now none. More expensive to drink in Thailand compared to KL, if you count bottle vs bottle. Oh well, still a nice destination. Glad I pegged the consultancy fees I do for a UK company in Thai Baht back when the GBP was around 75. Last edited by sundancekid; 20th April 2013 at 21:22. I think the Chancellor's stance may become more flexible next year when they start thinking of ways to buy the 2015 election from us with our own money; worked for Blair twice. I am sure it will.. As for austerity.. While the BoE prints already like crazy.. thats a joke.. The UK is borrowing an additional 120 bn each and every year to keep the lights on.. Austerity ?? Please !!! Trying to even slow the rate of growth in out of control budgets is called austerity.. Lets have a look at that austerity shall we ?? What we are seeing here (THB / Asean) is less about austerity and more about 'stimulus' money chasing yield globally, about hot money flowing out of trade deficit nations and into producing nations.. Its about the FED the BoE, The BoJ and every other bankrupt governments central bank pushing credit out there to get the 'consumer recovery' going by driving people further into debt. those consumer goods are made here, in China, in Indo, in all these countries who have a currency rise..
All part of a balancing cycle. As prosperity moves from the consumers and spenders to the creators and savers. Think you’re missing my point. It is a fact that when Cameron came into power, he and Osborne began an “austerity policy” with the specific intent to slash government spending. Which they did by the way, ten percent from overall spending by U.K. government departments. Problem was of course that the economy had not fully recovered after the recession. So instead of less debt, the deficit grew due to less tax revenue being collected and more entitlement benefits doled out. As should be clear by now, misguided austerity measures in the middle of a recession leads to even more debt... while Osborne and the ideologues keep scratching their heads. The numbers I gave above are total managed expenditure.. Please show me the 10% cuts.. They have borrowed 120bn plus a year..
Hows that paying down debt story going ?? Level of UK national debt when the Labour party left office was around £760bn. Under the Tories the government will spend a total of £2775bn in their first four years in office. In the last four years of the Labour government they spent £2431bn. So the Tories have INCREASED spending by 15%. Under the Tories the government will borrow in total £499bn in their first four years in office. In the last four years of the of the of the Labour government they borrowed in total £316bn. So the Tories have INCREASED borrowing by a staggering 57%. Under the Tories the national debt will be around £1398bn by the time of the next election. At the previous election in 2010 the level of debt in the UK was around £760bn. So the Tories will INCREASE the debt of the UK by a whopping 83% during their time in office. Show me the austerity... The cake is a lie.. Austerity means paying down debt, austerity means balancing budgets, austerity is not simply 'spending insanely with credit'.. There IS a limit to how much debt load a country can take. ^So when's the big day? Show me the austerity... The cake is a lie.. Austerity means paying down debt, austerity means balancing budgets, austerity is not simply 'spending insanely with credit'..
You're still not getting it. The Torries slashed government spending by 10% in 2010 expecting the debt to reduce. So the explicit policy they pursued was "austerity". But since this --- totally predictably --- has lead to no growth and higher unemployment the overall spending has in fact increased. As multiple studies have shown (I submitted a study of 100 countries over at PI), pursuing a policy to reign in spending in the midst of a recovery will only lead to higher debt. 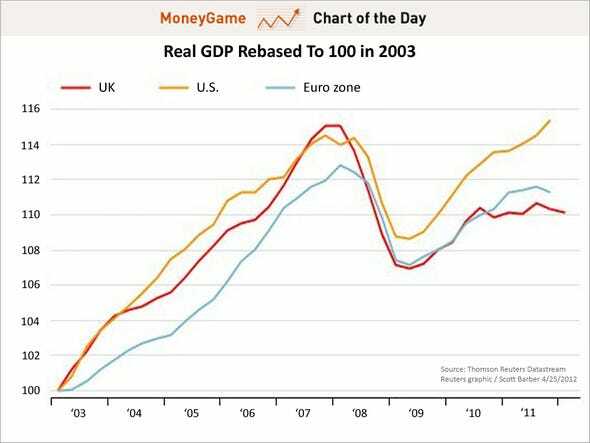 Like, why do you think the UK growth hit a brick wall just about when Cameron came into power? The trajectory looked fine until then. Same situation and same effects as when FDR eased up on the stimulus in 1937. There IS a limit to how much debt load a country can take. And the limit for countries that can issue their own currency is what exactly? An arbitrary number like Reinhart & Rogoff’s? Until(if?) the Japanese bond market collapses ... global QE infinity will keep the show on the road. You're still not getting it. The Torries slashed government spending by 10% in 2010 expecting the debt to reduce. So the explicit policy they pursued was "austerity". But since this --- totally predictably --- has lead to no growth and higher unemployment the overall spending has in fact increased. I get what your saying about increasing debt through decreasing 'economic activity' (but is that economy anyway when itys just purely sugar rush debt spending ??). What I dispute is this 10% slashing to government expenditure, despite what they 'claim' they 'will' do when they give speeches, what they actually did was..
Thats total discretionary expenditure.. Not debt, but money spent..
Wheres this 10% 'slashing' ?? Its an emotional response.. Not a line, as Japan has shown.. When a country is financing its budget via borrowing this can continue, until the debt load reaches a point where the market refuses to buy at that low interest rates and one of two things happen, the rates simply rise (spain greece, etc) or the government keeps printing money and buying its own debt, increasing the debt load, putting itself in an interest rate trap, devalueing its currency, and pushing the pendulum ever further from mid point (with the obvious snap back effect in time). There can be a long delay, while a government keeps buying its own debt and increasing its own debt load, but it cannot continue indefinitely.. At some point either rates skyrocket, a lack of faith in the currency develops, a series of price inflation (to catch up to the monetary inflation the government has embarked upon).. There is no growing out of these debt loads, only potential devaluation. More debt is simply not the solution to a debt crisis.. thats what the keynsians have asked for every step.. 2000.. 2005.. 2008.. 2011.. And all it has done is each and every time inflate a greater bubble taking the issue of a healthy normal recession, out to now a global derivative bubble. The medicine must be taken. I really wish I could find the economic piece I read a month or so comparing Hardings hands off approach (which had a recession recover so fast it barely registered) versus Hoovers approach (a copycat of which interventionist policies are being done now) which created and made much worse the great depression.